Winner of the Choice Hotels International Gold Award. The small family-owned and operated Econo Lodge On The Ocean hotel is on the Virginia Beach boardwalk. All rooms are oceanfront with private patios or balconies. Free continental breakfast. Free parking on the property (one space per room). The outdoor heated pool is open in-season. In this Virginia Beach hotel, all rooms are oceanfront with balconies or patios. All rooms have refrigerators, microwaves, and in-room safes. The Econo Lodge on the Ocean Hotel is located in Virginia Beach, Virginia on the oceanfront, at 2707 Atlantic Avenue. Map. It's on the boardwalk, in the middle of lots of other hotels, restaurants and shops. 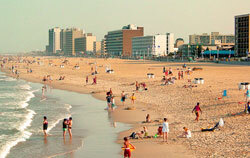 Virginia Beach Vacation Rentals - Enjoy all the comforts of home, away from home, with a vacation rental. A great option for families or groups vacationing together. Hampton Roads Events - Check out what's going in Virginia Beach and the nearby cities of Norfolk, Portsmouth, and Williamsburg. 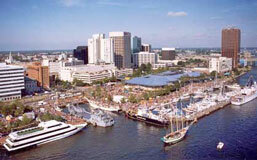 Virginia Beach Cruises - Take your pick from whale or dolphin watching cruises, sunsets, dinners and lunches. Plenty of options for getting out on the water.